Welcome to the lunacy that is our friend Scotty Parker, or as he’s referred to by his friends, Scotty Pickles. His thoughts are insane; they have no factual backup and everything is illogical and spelled wrong. But it makes me laugh. Anyways, onto Pickle’s Rantings. I know a lot of you have heard the recent news of the Brockasaurus testing positive twice for doping. And I would just like to say how vindicated I feel that this has happened. I refused to get aboard the Brock train. He only got a push in the UFC because he is a name. He has no business being a top contender. He beat a guy who was 75 years old to win the title only having fought 3 times and not even winning all three bouts. Then got his a$$ whooped and bounce back to the WWE. Then the UFC wanted him back to head line a broken card for their latest pay per view. The man they put in front of him was Mark Hunt to which most people responded with a resounding WHO???? Let me give you some background on Mr. Hunt. He's 42 years old, only that's like 127 in fighter years. A coconut head form New Zealand, middle earth for all you nerds. Who was on only 4 months’ rest before stepping into the octagon with Brockalicious. Now I'm not here to bash poor Mark Hunt, no sir. I'm only here to point out that the beast incarnate needed to cheat in order to beat this man. I though Brockadoodle do was the greatest Fighter the world has ever seen. And his strength and size were due to his Lifting and his consumption of jimmy John subs. Nope old Brockaround the clock had to CHEAT that's right kids Santa isn't reel, your parents don't love you, and Brockoli put things in his mouth he shouldn't have. He needed to cheat to beat a man half his size and twice his age. So all the times people boasted and yelled Brocketeer is the greatest fighter ever.... now not so much. So I'm just going to sit back and watch as the world watches ShamBrocks try to force his way out of this corner. But realistically nothing will happen to him. Come on who's going to try and take away anything from this beast. 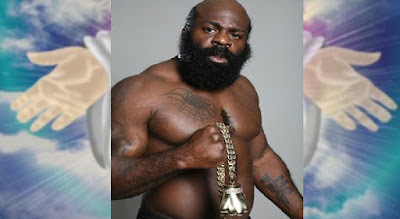 Which just makes me sad when I think about passing of true MMA legend & American hero, Kimbo Slice. Kimbo was a giving man with teeth of gold. He gave everything he had with every devastating blow, whether in a cage or on the streets. Kimbo had nothing handed to him like some other UCF fighter we all know Brock Lesner. He had to fight his way up. First in the sand box, when his first opponent took his only toy dinosaur, later he would battle his way through the streets, accepting any challenger who came his way. his first fight was defending a friend from a bully. Because that's the kind of person he was. He first found fame on something called YOUTUBE. It was there he displayed his aggressive nature and punished those who showed up to the BBQ without Beer. right before he punched him out. In August 2010, Slice announced his intention to become a professional boxer. In his professional career he went 7-0 with 6 KO's against some of the biggest guys fight out of back alleys. Guys with names like TANK and SETH. Guys so big they could only be named after cities (Houston) or numbers (5,000). Brock Lesner 0 KO's and fought guys like little Frankie, Heath Bar, Minn Soo, and Randy Couture when he was 90 years old. Next it was on to MMA and UFC where he went 8-3 with 6 KO's How you might asked, you guessed it "punches”. 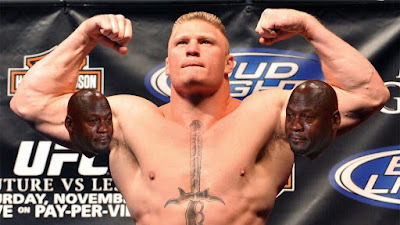 Brock's record 5-3, and he was the Champ? Kimbo never got a title shot his 3rd fight in he had to work his way the way everybody does, except if your name sounds Crock Pesner. On June 6, 2016, Slice was admitted to a hospital near his home in Coral Springs, Florida He died a short time later of heart failure, because it was just too big for a man of even his size could hold. A heart full of love and hope and giving. (devastating blows) Brock Lesner almost died of a tummy ache. Scott Cocker CEO of Bellator MMA, said in a statement: "We are all shocked and saddened by the devastating untimely loss of Kimbo Slice, a beloved member of the Bellator family. Brock Lesner was not mentioned.